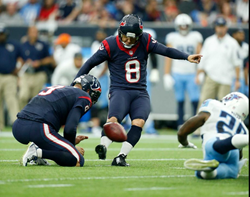 NFL Kicker Nick Novak has received Colleen’s Dream Foundation's 2015 “Dreamer of the Year Award” for his ongoing efforts to help fight ovarian cancer, according to Colleen’s Dream Foundation President Billy Cundiff. Colleen’s Dream Foundation was founded in 2012 by Billy Cundiff and his wife Nicole with the purpose of supporting research for early detection and improved treatment for ovarian cancer. Since 2013, Novak has helped raise over $30,000 for Colleen’s Dream Foundation through its Kicking for the Dream program, a fundraising program which encourages professional and amateur kickers from across the country to raise pledges for every successful kick they make during a game. According to Novak, Kicking for the Dream has allowed him to use his profession to fulfill a personal quest. Novak says this is why he knew he had to become involved with Kicking for the Dream. “When Billy told me about Kicking for the Dream and the goals he had for it, I knew it was a perfect platform for me to be an advocate for something I am very passionate about,” says Novak. “So every year that I participate, I do so in memory of Annie. It allows me to keep her memory alive and bring awareness to the fight against ovarian cancer." Cundiff has only praise, admiration and appreciation for his fellow NFL kicker and says awarding him with Colleen’s Dream “Dreamer of the Year” award is the least they could do. NFL kicker Billy Cundiff launched Kicking for the Dream in May of 2013, as an effort to support Colleen’s Dream Foundation. Colleen’s Dream Foundation raises money to support research for the early detection of, and improved treatment for, ovarian cancer.